The Museum of Belize was officially inaugurated 10 years ago on February 5th, 2002. Â The building itself was once used as ÂHer MajestyÂs PrisonÂ, and contained a total of 102 cells. In 1998, the Government handed the old prison to NICH and for the next two years the building was refurbished and converted into the Museum. In celebration of its 10th anniversary, the Museum hosted a 10-day celebration. Activities included special guest lectures, book presentations, art workshops and special exhibition featuring the Jade Head. The priceless object which had not been on display for quite a few years was particularly displayed for primary school students. According to Sheryline Jones, Director of the Museum of Belize, the last time the exhibit was out for public display was in 2009. She continued by stating that students were given basic information about the Jade Head like its size, weight, where and when it was found among other important details. Among all the primary school children throughout the country of Belize that had the opportunity to visit the Museum and see the exhibit of the National Treasure was the Teacher Barbara AnconaÂs Standard VI class of the Island Academy. They went for a day trip to Belize City and had the opportunity to see the Jade Head up close and personal. Something many wished they could do. The Museum of Belize and Houses of Culture is dedicated to the promotion, documentation, exhibition and understanding of BelizeÂs culture and history. Since opening its doors in 2002, it has welcomed over 150,000 visitors. It features several educational and exciting exhibits, including a wonderful display on the Ancient Maya, beautifully carved Jade Display, a Stamp collection and the most recent exhibition, Eye of the Storm Â 50 Years after Hurricane Hattie. The Jade Head weighs 9.75 pounds and 5.86 inches tall, and is the largest object discovered in the Mundo Maya. The Crown Jewel of Belize was found at the Temple B4, the tallest Maya Temples at the site of Altun Ha. It was discovered in 1968, and the excavations at Altun Ha were the largest scale and long term archeological feat ever undertaken in Belize. Dr. David Pendergast of the Royal Ontario Museum of Canada was the one who discovered the Jade Head and was astounded to have found such item. At the temple several artifacts including ceramic bowls, shell beads, jadeite anklets, bracelets and beads, pearls, pyrite and hematite artifacts were found including the most outstanding of all, a carved jade head of the Sun God, Kinich Ahau. 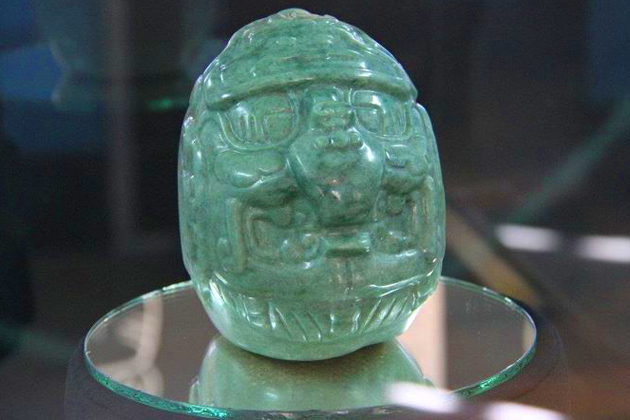 The jade head remains the single largest carved jade object yet discovered in the Maya area. Its crossed eyes, fang-like elements on either side of the mouth, and the ahau glyph on the forehead all identify the head as a representation of the Maya sun god Kinich Ahau. Along with Chac (rain god) and Yum Kax (corn god), Kinich Ahau was among the most important deities in the Maya pantheon.